COLLEGE PARK, Md. -- New electromagnetic propulsion technology being tested by the University of Maryland's Space Power and Propulsion Laboratory (SPPL) on the International Space Station could revolutionize the capabilities of satellites and future spacecraft by reducing reliance on propellants and extending the lifecycle of satellites through the use of a renewable power source. Because a finite propellant payload is often the limiting factor on the number of times a satellite can be moved or repositioned in space, a new propulsion method that uses a renewable, onboard electromagnetic power source and does not rely on propellants could exponentially extend a satellite's useful life span and provide greater scientific return on investment. Associate Professor of Aerospace Engineering Ray Sedwick and his research team have been developing technology that could enable electromagnetic formation flight (EMFF), which uses locally generated electromagnetic forces to position satellites or spacecraft without relying on propellants. Their research project is titled Resonant Inductive Near-field Generation System, or RINGS. RINGS was sent to the International Space Station on August 3 as part of a payload launched on Japan’s HTV-4 Cargo Ship from the Tanegashima Space Center. The project is scheduled for four test sessions on the research station. Astronauts will unpack the equipment, integrate it into the test environment and run diagnostics. From there, RINGS will undergo three science research sessions where data will be collected and transmitted back to the ground for analysis. RINGS is composed of two units, each of which contains a specially fabricated coil of aluminum wire that supports an oscillating current of up to 18 amps and is housed within a protective polycarbonate shell. Microcontrollers ensure that the currents oscillate either in-phase or out-of-phase to produce attracting, repelling and even shearing forces. While aluminum wire was chosen for its low density in this research prototype, eventual systems would employ superconducting wires to significantly increase range and performance. 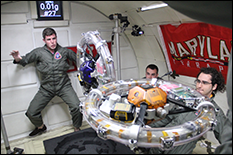 In the spring of 2013, RINGS was tested for the first time in a microgravity environment on NASA's reduced gravity aircraft. UMD graduate students Allison Porter and Dustin Alinger were on hand to oversee the testing. RINGS achieved the first and only successful demonstration of EMFF in full six degrees of freedom to date. "While reduced gravity flights can only provide short, 15-20 second tests at a time, the cumulative test time over the four-day campaign provided extremely valuable data that will allow us to really get the most from the test sessions that we’ll have on the International Space Station," said Sedwick. In addition to EMFF, the RINGS project is also being used to test a second technology demonstrating wireless power transfer (WPT). WPT may offer a means to wirelessly transfer power between spacecraft and in turn power a fleet of smaller vessels or satellites. Having the power to support multiple satellites, and using EMFF as a propellant-less means to reposition those same satellites, provides the flexibility to perform formation control maneuvers such as on-orbit assembly or creating synthetic aperture arrays. A synthetic aperture array uses a network of smaller antennas to function collectively as one large antenna. Larger antennas are capable of producing higher resolution images and better quality data. The RINGS project has been a collaborative effort between UMD SPPL and partners from the Massachusetts Institute of Technology (MIT) and Aurora Flight Sciences (AFS). 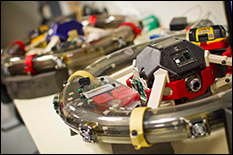 MIT's SPHERES (Synchronized Position Hold Engage Re-orient Experimental Satellites) program provided SPPL an existing test bed of miniature satellites and control algorithms that will be used to integrate and test the RINGS technology. AFS has provided hardware development and support for the integration of RINGS onto the SPHERES platform. SPPL began work on RINGS in 2011, and the project is funded under a joint DARPA/NASA program that aims to demonstrate and develop new technologies that could enable future space missions by using a network of smaller spacecraft. For more information on SPPL, visit www.sppl.umd.edu. For more information on the RINGS project, visit the project's web page.